No team gets anywhere without a good gaffer and League1 is blessed with many established and up-and-coming coaches working tirelessly to unlock their team's potential. In 2018, one team in particular stood out for the work done by the head coach, and in his first year at the helm. Meet your 2018 League1 Ontario Men's Coach Of The Year! FC London's Mike Marcoccia is not a new face in League1, having won two titles in the women's division, but 2018 marked the turning of a new leaf as he took over the club's men's side for the first time. Marcoccia made an impression immediately, starting the season off with a hard-earned 1-1 draw away to Toronto FC III. This was already a step forward as, in the parallel opening day fixture the year before, London was blown off the park 6-0 by the Junior Reds. A new look London clearly wouldn't have that happen again in 2018. London quickly hit their stride, getting a 2-1 win over 2017 Finalists, Woodbridge Strikers, in their next match, before laying down a convincing 3-1 home result over Pro Stars FC. As the season progressed, London continued to show excellent team cohesion, structure and that elusive ingredient of chemistry between players. The mettle of the manager and the team was obviously going to be an issue for opponents. Despite setbacks in an away loss to Sigma and a home loss to Oakville Blue Devils, it was a credit to the manager that the team always responded with a run of wins to follow. By season end, London had achieved a club first. The team finished top of the regular season table with the most goals scored and the third best defensive record. Despite falling in the post-season to eventual champions, Vaughan Azzurri, London had shown it was a club in the ascendancy. 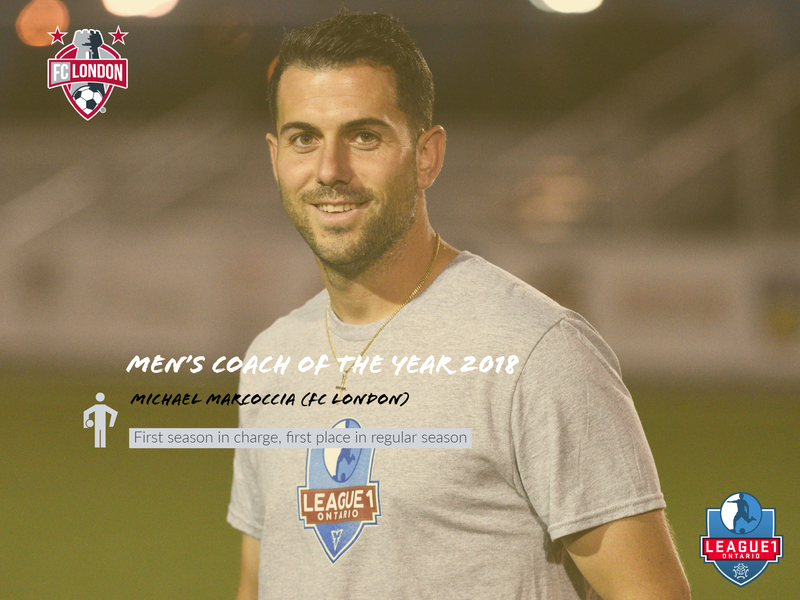 Congratulations to Mike Marcoccia and FC London on your 2018 Men's Coach Of The Year Award!